It’s not a usual play the San Antonio offense runs, but it was interesting enough to dig into, and it resulted in points. 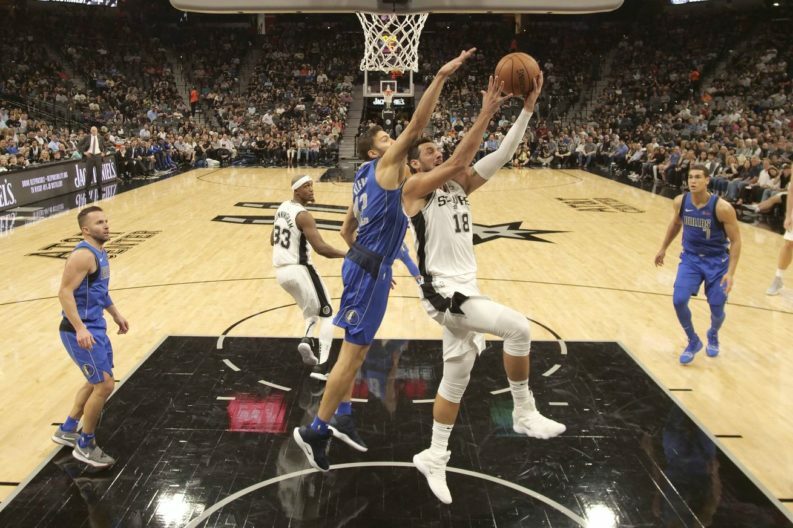 Early in the fourth quarter Monday night, the Spurs were up to their old tricks again, swinging the ball around the floor for easy buckets. This time, Rudy was the beneficiary. That’s awfully pretty, but it’s hard to see all the hard work and good decisions that went into generating such a great look from that angle. Here’s the whole play. The Marco Belinelli / LaMarcus Aldridge pick and roll generates a switch, and just about the worst kind for an opposing defense. There’s simply no way Jalen Brunson, a 6’3” 190 lb. point guard, has a chance in the paint against Aldridge. 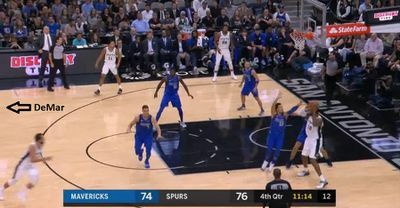 He tries to front, but Dwight Powell falls for a ball fake, and gives Belinelli a chance to lob the ball over the top. Maxi Kleber doubles on the catch, so LMA calmly takes one dribble out towards the perimeter to get a little space, and pull the double a little farther away from the basket. On the opposite side of the floor, J.J. Barea drops to the level of the ball to take away the potential pass to Rudy Gay in the corner. That leaves two Mavericks – Powell and Dorian Finney-Smith – to guard three Spurs – Belinelli, DeMar DeRozan, and Bryn Forbes. Once Aldridge picks the ball up, Brunson should either abandon the double or commit fully to the trap, but he does neither. He’s still committed to Aldridge, but not close enough to affect the pass. Marco moves along the arc towards LaMarcus opening up a passing lane to him, and also creating room for a pass to DeMar at the top, since Powell stayed with Marco on the move. That pass to DeRozan is probably the better choice in this case, which is hard to say given the end result of this play, but it likely ends up producing the same shot, just a little faster and with fewer high-risk passes. Finney-Smith would pick up DeRozan, and DeMar would swing it to Forbes. Bryn would have Barea coming at him, so he’d swing it to Gay. The ball would spend less time in the air, making it even harder for the Mavs to rotate. That’s not the choice Aldridge makes though. He kicks the ball out to Belinelli on the move against a rotating defense. Just as he catches the ball, Marco checks the alignment on the floor and sees he also has two options. DeRozan at the top of the key and Forbes on the opposite wing. Finney-Smith moves towards DeMar, so Marco throws a sailing skip pass high enough that Bryn has to jump to make a clean catch. Forbes is shooting 45.5% from three so far this season, so Barea has to close out to him, leaving Gay open in the corner. Bryn wastes no time and makes the next pass while still in the air. Rudy catches the ball with just enough time to gather and shoot an open corner three before Brunson can make it all the way across the court. The degree of difficulty here is higher than it needs to be, but they still get the job done. Having Bryn Forbes and Rudy Gay on the opposite side of the floor puts a lot of stress on the defense, and when the Spurs make quick decisions and accurate passes out of double teams, the end result will continue to look like this. The team has struggled with that to some extent so far this year. Opponents have gotten away with doubling LaMarcus Aldridge far too much. If the Spurs can continue to capitalize on these opportunities, that will make life a lot easier for him down low.